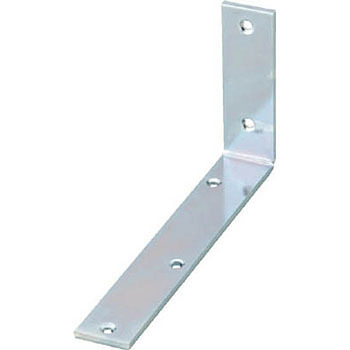 Reinforcing, fall prevent, shelf bracket, brackets. On the office desk, we used two shelves received in a U shape in a shelf board receiver to put two monitors. The shelf board used 900 mm in width and 250 mm in depth, and the shelf reception distance was 600 mm. Although it is subjective, I think that it has enough weight of 2 monitors (about 10 kg). Since it was leaning forward, separately, the L-shaped hardware was attached to the lower part of the shelf bracket that was connected to the U shape, and it was caught in the top board and prevented from tilting. This review is about item#39462385. It is strong and solid making. Installation is no problem. Delivery took nearly a week, but I would appreciate it if you shorten it a little more. This review is about item#39462367. Sturdy and beautiful, the price is reasonable, but something a little cheaper was better. This review is about item#39462351. It was used to fix the tance to the wall of the room, the top of the tance was higher than the part of the wall of the wall and it was finally found by finding a suitable length and a metal fitting that can use dish screws from both sides. After attaching the metal fittings according to the height of the dresser, the dresser was fitted and the dressing was fixed from the upper surface of the metal fitting. It was difficult to adjust the subtle height of the metal fittings. I wish the screw hole was a little long hole.